​​I have always been a maker. I made my own clothes as a teen and would scour my nanna's Golden Hands magazines as a kid looking for all the macrame patterns. Embroidery, felting, beading, marbling, jewellery making: I have done it all and have the craft stash to show for it! In high school I decided I wanted a life in the theatre. So I put my crafts away and spent many, many hours tap dancing and practising my scales (with the dog joining in). It finally paid off and I was accepted into WAAPA in 2002. I finished my formal education with a degree, some certificates and a Grad. Diploma (Education) under my belt. While rehearsing no-budget cabarets on weekends, I got a teaching job. One thing led to another, as these things do, and I found myself rediscovering my passion for the visual arts. ​I didn't study art in high school, so I set about teaching myself and taking the odd workshop. At this point I should mention that my dad, my uncle, my cousins, my grandfather are all surfers. I never got it. Then, in 2007, I caught the stoke. A weekend surf camp with some friends and I finally understood. It was around this time I started painting with watercolours. When travelling around the world in 2010 on a 'surfari', I was inspired by artists in California and Hawaii, who use their medium to express their love of; and relationship with the ocean. ​Back on our 'Island Home', of course, lots of people have a deep love of the ocean and it finally clicked to combine my two passions. I now create art that captures the surfing lifestyle. ​Through Mermaid’s Coin, I combine my two passions, surfing and making, to create limited edition artworks and objects evocative of the beach, ocean and surf culture. 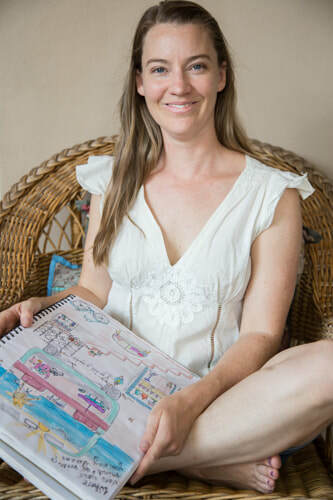 It is a one-woman, Fremantle-based business creating ‘surf art’ that is vibrant, retro and fun. I pride myself on my attention to detail. Wherever possible products, are made from sustainable materials. Collagraph prints are created using traditional printmaking techniques, water-based inks, and an etching press and then tinted with artist quality watercolours – so each one is unique. Ready for some salty goodness? I now try to balance my creative business with the business of raising two small humans, working part-time, herding cats, and getting into the waves when the swell is up. Oh, and trying to convert as many non-surfers as I can to the joys of surfing. I sell fine art intaglio prints, giclee prints, cards, stationery and home decor via my Etsy store, artisan markets and local & international stockists. I license my art and also teach my skills to others. Mermaid's Coin is made for the surfer girls, surfers at heart, those decking out a beach house, or just wanting a little bit of Summer to hang on their wall. Wanna some colour in your inbox? Sign up to my newsletter.